David Robertson, MD, internationally known for his groundbreaking work in defining and treating often-debilitating neurological disorders of blood pressure regulation, will be honored with a two-day symposium May 3-4 at Langford Auditorium. “Diagnosis and Treatment of Autonomic Disorders” will feature talks by Vanderbilt University faculty members and speakers from around the world. The symposium is open to the public; registration is requested. Physicians can receive continuing medical education (CME) credit. For more information and to register, go to https://medicine.mc.vanderbilt.edu/Dr-David-Robertson-Legacy. 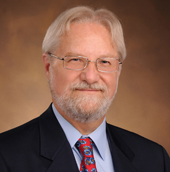 Robertson retired from Vanderbilt last year after serving for 30 years as director of the Clinical Research Center and for 39 years as founding director of the Autonomic Dysfunction Center. The center was the first to be devoted exclusively to diagnosis and treatment of disorders of autonomic blood pressure regulation. Through the center Robertson and his colleagues discovered previously unrecognized disorders including dopamine beta-hydroxylase deficiency, norepinephrine transporter deficiency and baroreflex failure. Patients are referred from all over the world for diagnosis and treatment of various forms of chronic intermittent hypotension, postural orthostatic tachycardia syndrome and other forms of orthostatic intolerance. Vanderbilt speakers include current Autonomic Dysfunction Center Director Italo Biaggioni, MD, CME activity director Cyndya Shibao, MD, Andre Diedrich, MD, PhD, Luis Okamoto, MD, Amanda Peltier, MD, and James Muldowney III, MD. Others include neurology professors Phillip Low, MD, from the Mayo Clinic, and Horacio Kaufmann, MD, from New York University, and two former Vanderbilt faculty members — Randy Blakely, PhD, executive director of the Florida Atlantic University Brain Institute, and Satish Raj, MD, from the University of Calgary’s Libin Cardiovascular Institute. Also on the agenda are talks by Jens Jordan, MD, head of the German Aerospace Center’s Institute of Aerospace Medicine; Raffaelo Furlan, MD, director of the Medical Clinical Operations Unit at Humanitas Research Hospital in Milan, Italy; and Giris Jacob, MD, who directs an Autonomic Dysfunction Center in Tel-Aviv, Israel. Several of the speakers trained under Robertson at Vanderbilt.